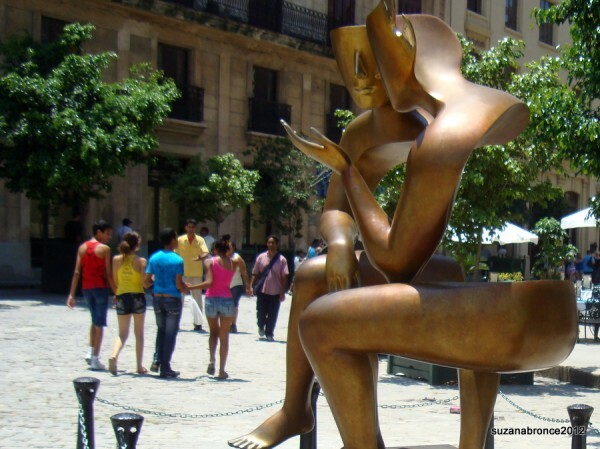 A new work of art has proved its own success by exciting much talk among Cubans and tourists alike in Plaza San Francisco de Assisi; one of the most highly visited plazas in Havana old city. 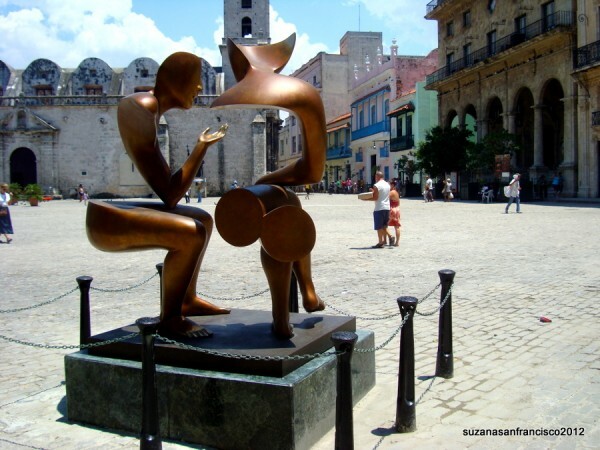 “The Arts” have always been supported by the Castro regime in Cuba, and many plazas have noteworthy sculptures on display funded or commissioned by the Cuban government! Plaza San Francisco can boast more than its fair share! The newest addition to this spacious plaza, was inaugurated on 25th May 2012. It was donated to the city of Havana by one Vittorio Perrota as a gesture of friendship between France and Cuba. 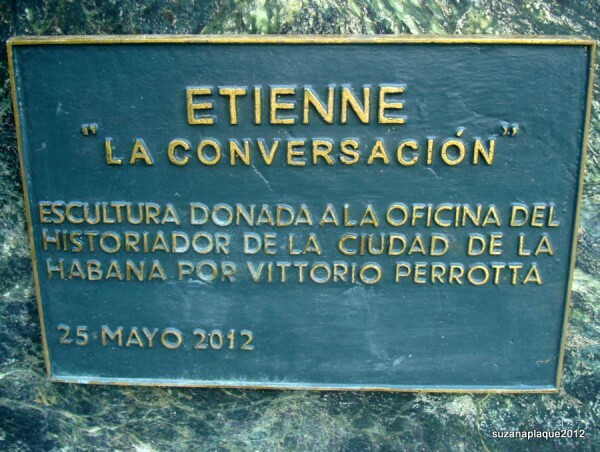 The Conversation “La Conversacion” is the work of French sculptor Etienne who was present at the unveiling ceremony along with Vittorio Perrota, the French ambassador and the historiador de la cuidad de la Havana. The sculpture itself is a beautiful bronze casting of a conversation between two people in an attitude of serious exchange of ideas! It is mounted on a lovely plinth of Cuba’s finest marble and hidden within this plinth is a box containing French and Cuban coins plus a message for future generations! The importance of verbal, face to face conversation in this age of text messaging and social networking needs to be emphasised. That conversation is an important part of Cuban life can be seen as its a theme that runs through many artworks in Cuba where all have been unable to voice their beliefs and ideas freely since liberation in 1959. The figures have parts missing from their bodies allowing a clear view through to the plaza beyond. The spaces are in many ways the most interesting aspect of this intriguing sculpture, like the things unsaid in a conversation that help us to read between the lines and understand what people really mean to say. Follow this links to read and see some of the other artefacts adorning the plaza San Francisco in Havana. If you have more time to explore then “Mi Cubita” would be our choice for you!